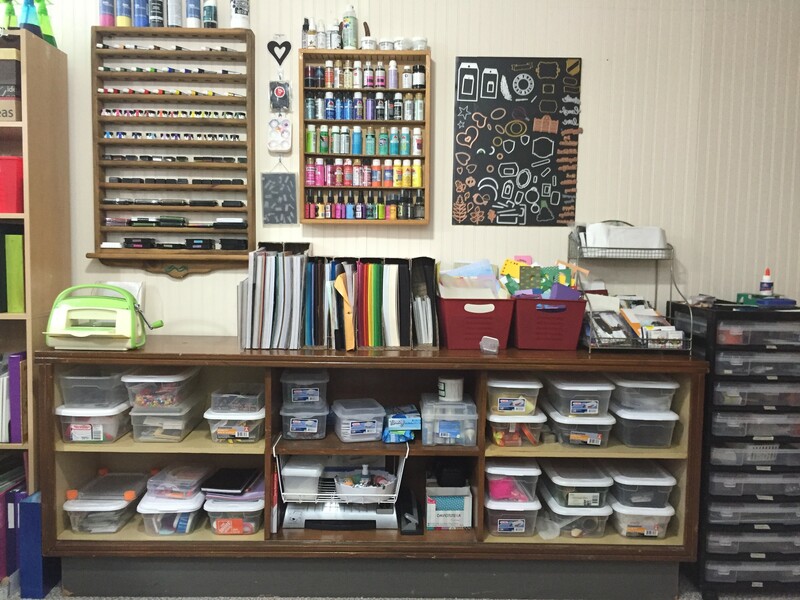 I previously posted a quick tour of my craft room, but here are some more details about it. 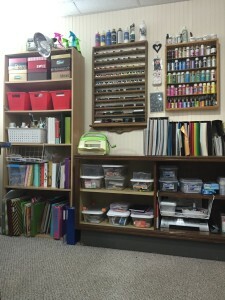 My craft room is an L shaped room is in our basement that has a hodge podge mix of furniture, some repurposed shelves, and lots of storage bins and boxes to hold my favorite things. It doesn’t get much natural light, however the room is painted a pale yellow and I have several lamps to brighten up the space. 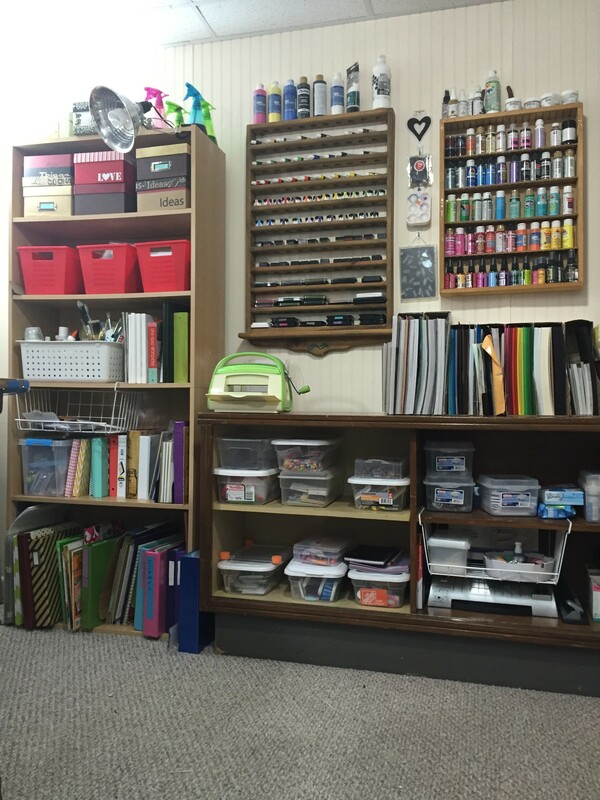 I could move my craft room up to the main floor where there’s lots of natural light or even to an extra bedroom upstairs, but I like the basement because I can sew or craft anytime without the noise interfering with someone else watching T.V. or trying to sleep. In my sewing area my sewing machine sits atop an old Singer sewing machine cabinet. 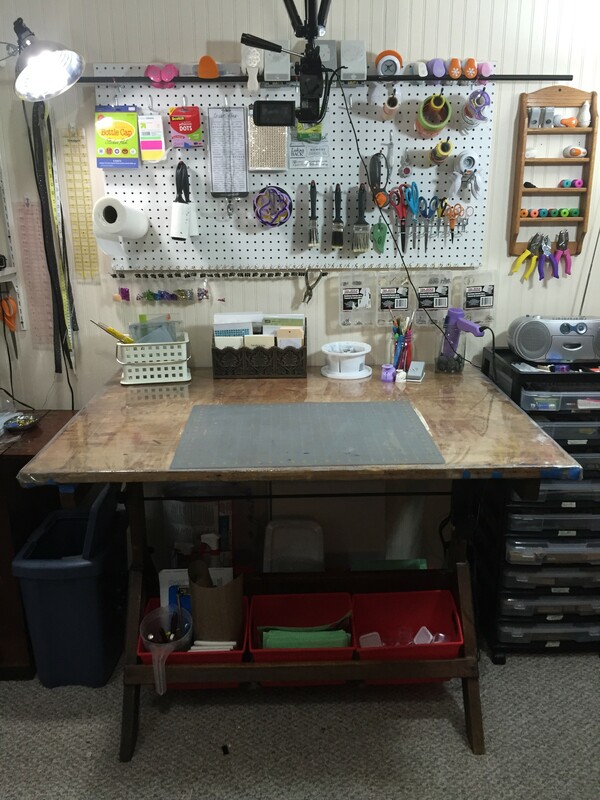 The cabinet has a small drawer to the left that I use to hold extra pressure foots and tools for my sewing machine. It also has a door that opens to three other small drawer spaces, but I often forget about them so I use them to store the manual and extra parts for the old Singer machine that came with the sewing cabinet. The old Singer machine is still attached to the cabinet and is folded down under the area where my machine sits now. On the wall behind the machine hangs three shelves, a thread rack and a rack for my sewing scissors and my sewing rotary cutter. 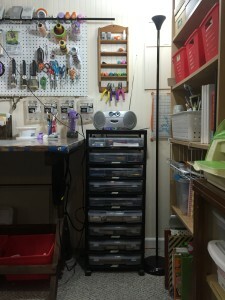 On the top shelf is a small box that I use to keep my hand sewing supplies in. The green buckets on the second shelf hold magnetic snaps, fabric labels and bits of interfacing I use for making purses. 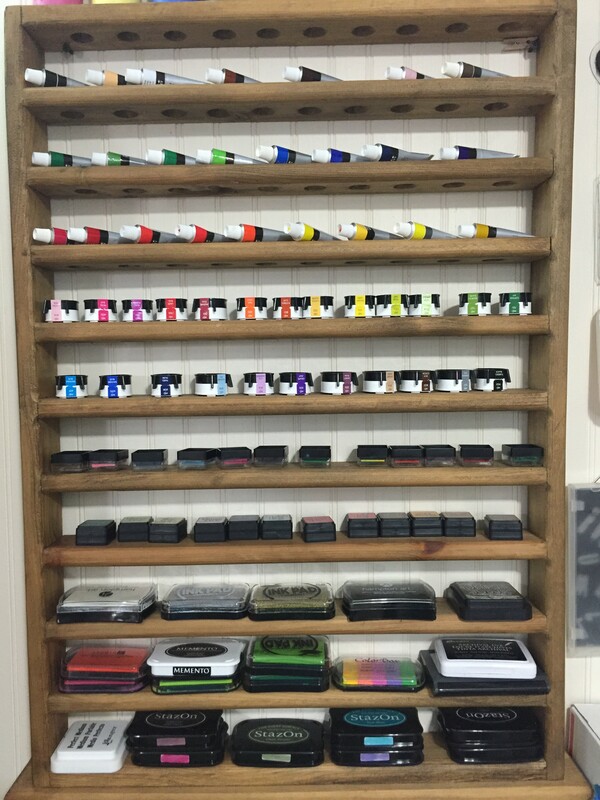 My iron, clock and some buttons are on the bottom shelf along with a few little plastic drawers that hold o-rings and d-rings of various sizes. Next to the sewing area is my craft table and peg board. The table is a drafting table I got free from work. The table needs to be refinished because the top is a little rough, but I just covered it with some clear vinyl so that it wouldn’t snag any of my fabric. The table is adjustable and I keep it about counter height because I like to stand while working, although I do have a chair close by just in case. 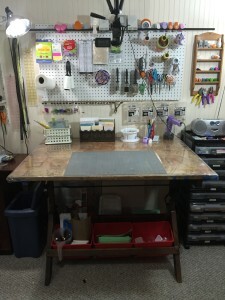 Atop the table is a basket that holds my stamping blocks, Stamp-a-mijig, and a small StampeRor. 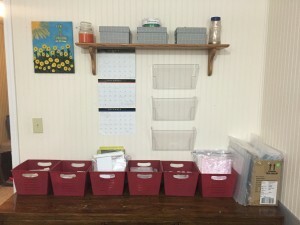 There is also a letter sorter I use for pre-made card bases and sentiment inserts. A cutting mat, water bucket for paint brushes, my heat tool and a mason jar for pens and pencils are usually on the table as well. Under the table in the red baskets I keep scrap paper, paint spatulas, a craft mat and other miscellaneous things. A peg board in on the wall behind my table. It holds scissors, tape, paper towels, punches, and lint rollers. My video camera hangs over the table. The camera is attached to a tri-pod that’s hung upside down from the brackets in the drop ceiling. To the right of my table is a storage cart I bought at JoAnn’s. (I actually bought three carts when they were on sale for 50% off with an extra 20% off coupon and combined them from three carts with 6 drawers into two carts with nine drawers making them a little taller than my table.) My radio cd player sits atop the cart along with some gel pens, a tape runner, some glue and a few other odds and ends. 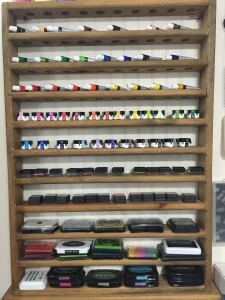 The drawers on this cart contain more pens, glue, and tape, markers, colored pencils, gelatos, stickers, stencils, clear stamp and wood mounted stamps. On the wall behind the cart it a small shelf for my smaller punches. 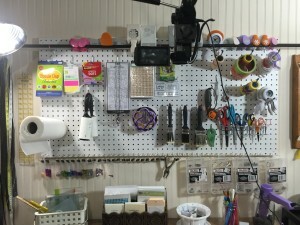 Next to the shelf I hang my scoring board and larger paper trimmer. There is also a lamp in the corner. The bookshelf on the wall to the right of my table has my scrapbooks, some magazines, 3-ring binders with more clear or cling stamps, small blank canvases and craft books on the bottom two shelves. the middles shelf has more books and small binders. 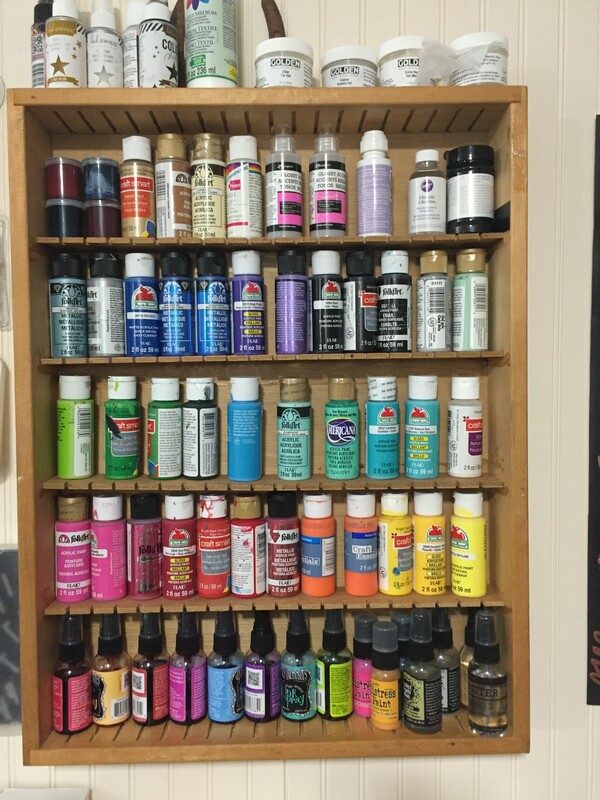 The white basket on the middle shelf has paint brushes, Modge Podge, gesso, and modeling paste. One of the red baskets on the next shelf has envelopes for cards. The other two red baskets hold embossing folders and dies for my Cuttlebug which sits on top of a storage unit that’s next to the bookshelf. The six photo boxed on the top most shelf contain extra cards I’ve made and receipts for tax time. 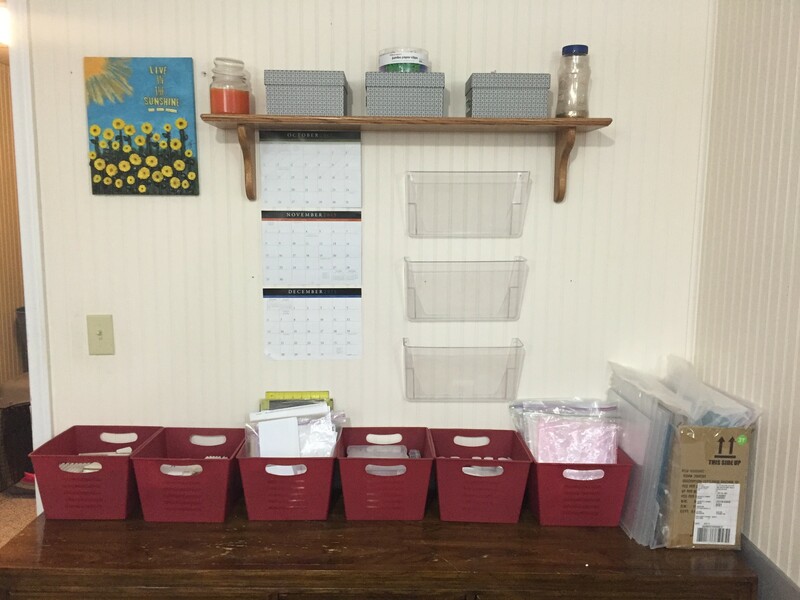 This storage shelf is to the right of the bookshelf and I store my Cuttlebug and paper on top of it. Inside on the shelves the clear plastic shoe boxes contain emblishements, Stickles, and various ephemera. I also store my laminator, some washi tape and baby wipes in this unit. Above the storage unit on the wall is a shelf I bought at a thrift store. I think it was for golf balls, but I turned it upside down and use it form my ink pads and small tubes of paint. 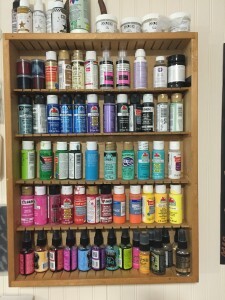 This shelf was a cassette tape holder my husband had that I repurposed to store my small bottles of paint and spray inks. 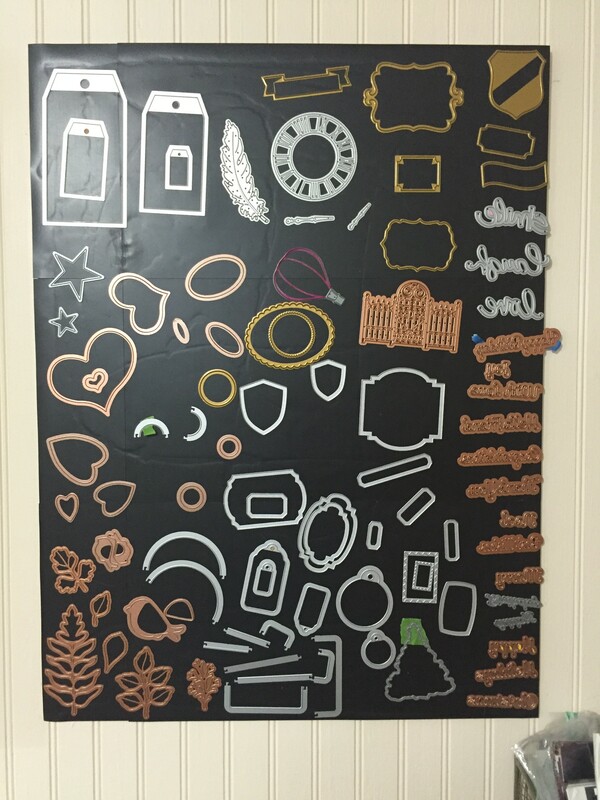 I made this board by gluing some magnetic vent covers to and old picture frame backing and as you can see I use it to hold some of my dies. To the left of the door as you walk in my craft room I have an dresser that was left from the previous homeowners. I use it to store mailing envelopes, extra light bulbs, trash bags and extra sewing supplies. On top of the dresser the baskets contain coasters and some things I use to make StampeRor’s. 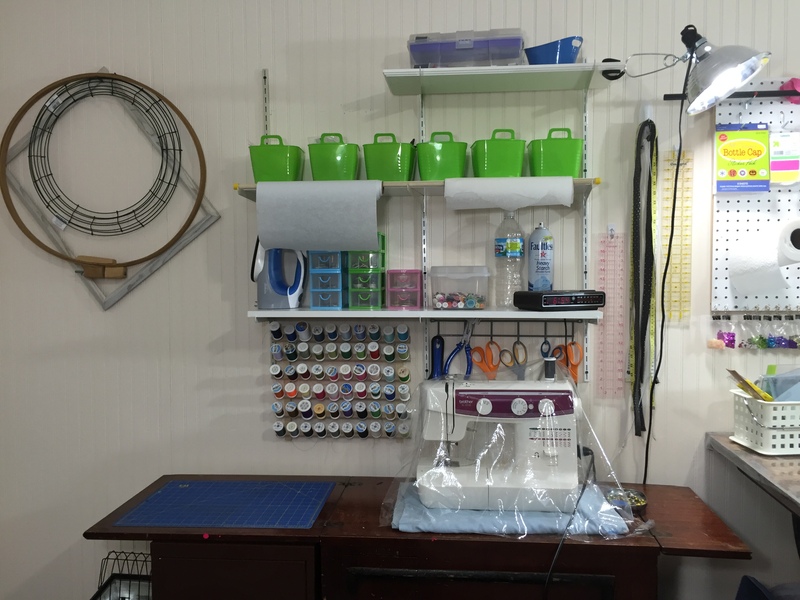 There are two black shelves behind my sewing machine area that hold my fabric. The baskets on top of these shelves contain zippers, elastic, paper patterns and left over interfacing. 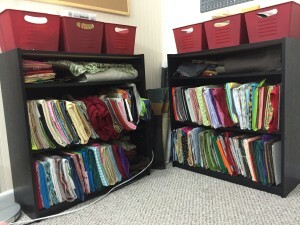 A closet in the room is where I store finished purses , bags and thing I use at craft fairs. I also recently brought my treadmill into my craft room with the idea that I would use it more if it was in my favorite space. I have used it more, but still not as much as I should. Next I plan to work on some art and decorations for the room. I recently re-organized and cleaned my craft room and I wanted to share a quick tour of it. To make this years Halloween cards I decided to use a card stock paper pad I purchased at Joann’s. The paper pad included a 12 x 12 cut apart sheet that contained 14 treat themed pieces and I planned to use the pieces to make 14 cards, but ended up with only 12 cards because I used three of the pieces for 1 card. In addition to the card stock paper pad I also used 110 lb Recollections black card stock from Michael’s for the base of the card and an orange piece of card stock inside the card for the sentiment. To speed up the process of the card making I first cut and folded the black card stock base and then cut the orange card stock inside pieces. I then cut apart the cut apart sheet. At one point I also inked the edges of all the pieces I cut apart, but ended having to re-ink the edges as I trimmed to pieces to size.